A long road, but Subaru has finally reached the second good point in his stay in this world. Finally, finally….getting his date with Emilia set! Hopefully this time he isn’t murdered in his sleep. 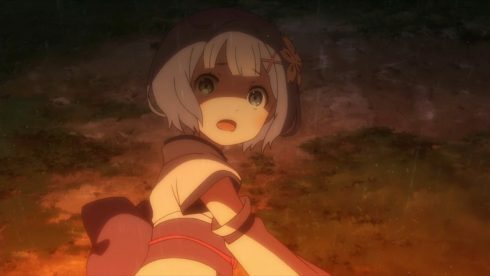 This was a really nice episode for getting to know more about Rem and Ram, as well as resolving this shaman incident in spectacular fashion. As expected they did manage to survive this one and move the plot forward a little bit. Shocking that for the rest of the world it has only been 4 days since the fight against Elsa. For Subaru and the rest of us though it has been so much longer than that. A truly grueling struggle to find his place and secure it. While I am completely sure he is in for a hellish road ahead, he at least has this save point to come back to. Finally, finally has gained the trust and friendship of Rem and as always has a strong trust existing with him and Emilia. It really was nice to see the flashback for Rem and Ram’s childhood. 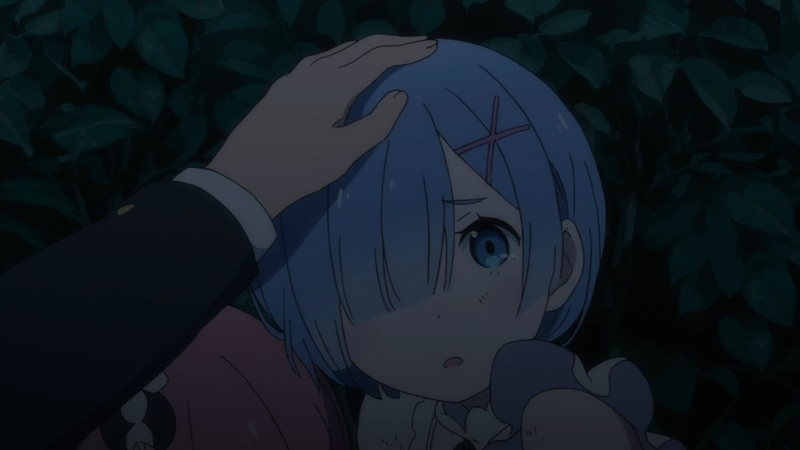 Really get to see where Rem’s emotional complex comes from. Her whole life has been a kind of messed up state of emotions. Within a short time of being alive she and her sister were going to be killed for being twins. Then her sister displayed her prowess and for her whole life Rem had to struggle and endure the realization that her sister vastly outclasses her in every respect. 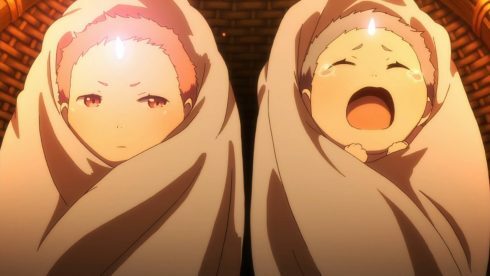 If Ram is the genius, Rem is exactly what people fear when twins are born. 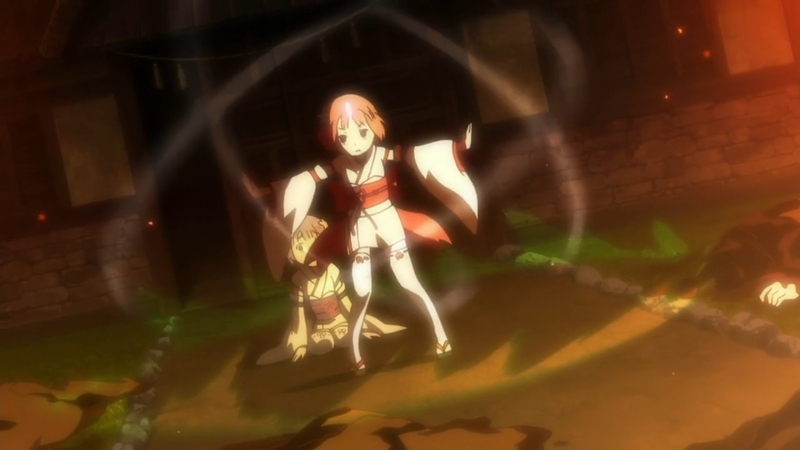 Rem is an Oni who isn’t overly powerful or skilled with her magic. When compared to her sister she falls terribly short and probably compared to average Oni she is pretty inferior. Rem constantly had to suffer both the expectations of being Ram’s sister and the disappointment from others that she wasn’t Ram. Was just utterly sad when Rem utterly gave up and just decided to live comfortably in her sister’s shadow. And things only got worse for Rem as time went on. When their village was attacked by that witch cult….it all went to hell. She lost almost everything. Her family, her home, it all went up in flames. And then her sister lost her horn. That very brief moment of satisfaction/happiness would end up torturing Rem even more than her childhood did. 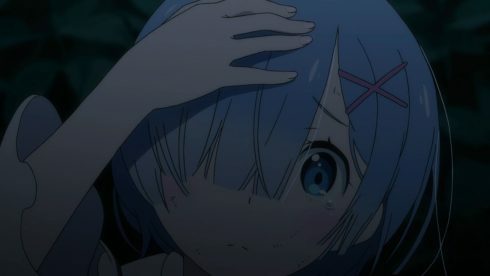 Just kind of sad that Rem ended up hating herself even more than she already did after that. It’s not shocking that she felt some happiness. She was now the superior one….Someone who has to live in another’s shadow probably would feel a brief bit of happiness at seeing them fail. 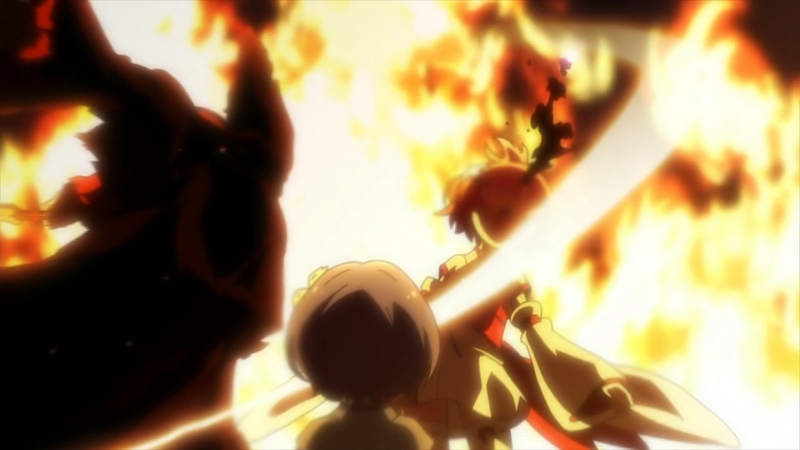 But sadly…Rem went too far. Just hating herself for that and trying to atone and live up to an impossible standard. Giving her all, constantly giving 100%, but hating herself the whole time. Never feeling like it was good enough, that it wasn’t enough compared to what her sister used to be able to do. And seeing her sister struggle probably made Rem feel guiltier. 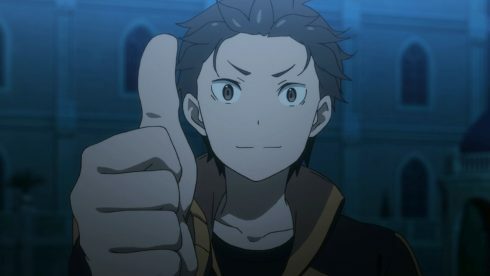 In general I agree with Subaru’s stance. Though I did find myself respect Ram more after the past few episodes. Rem needs to stop hating herself. Yes, her sister lost her horn. That’s terrible. But it won’t make anyone happy to have Rem torturing herself. 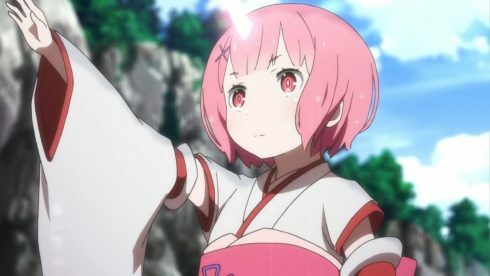 Won’t make Ram happier, won’t make Rem happier, and won’t make anyone happier. Rem has to live with what the reality is. Be proud of her skills and what she can do. Just rely on others around her for help with what she can’t do. Work with her sister to cover their weakpoints and be stronger as a whole. Sometimes…you just have to smile and stop thinking about gloomy things. 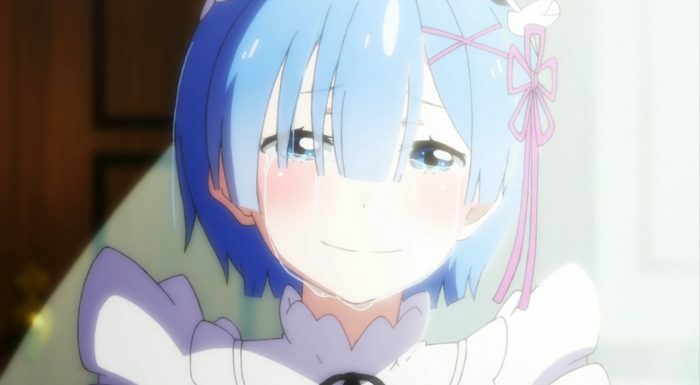 Rem is better off smiling, I’ll agree with that 100%. While I don’t think a romance will come out of this, I fully support a good friendship between these two. I did have more respect for Ram after seeing all this though. She wasn’t a bad sister, in fact she was a spectacular one. I think Rem is right to look up to her in that sense. Her powers only truly awakened when Rem was crying and they were in danger as babies. Ram was constantly looking out for Rem and always wanted to see her sister happy. 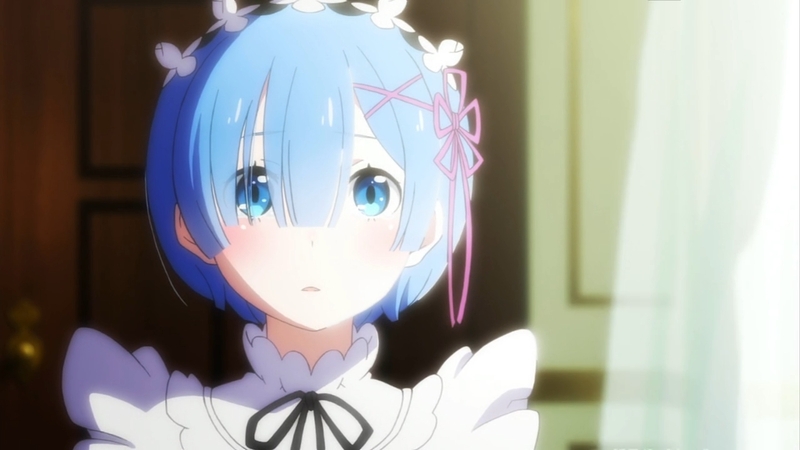 Ram probably hated how everyone either placed unrealistic expectations on Rem or were disappointed with Rem. Ram did all she could to look out for her sister. 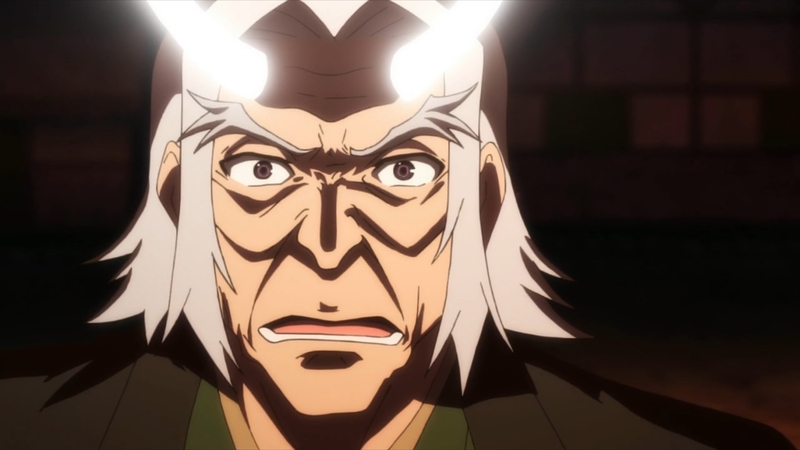 And Ram was most definitely a genius of an Oni. Just….unbelievably skilled. The Witch Cult that seemingly destroyed their village…she was slaughtering them. And Ram was just a kid at the time. Her only weak point was lowering her guard around her sister. That’s not a bad flaw at all. One wrong turn and she lost her strength. It’s really a tragedy for Ram. Like a pro athlete who loses an arm or a leg. They just aren’t the same. That amazing ability is just lost and the world is a bit worse off for it. But Ram has found her way in the world and adapted to what is a disability. She’s lost something intrinsic to her, but she’s still alive. 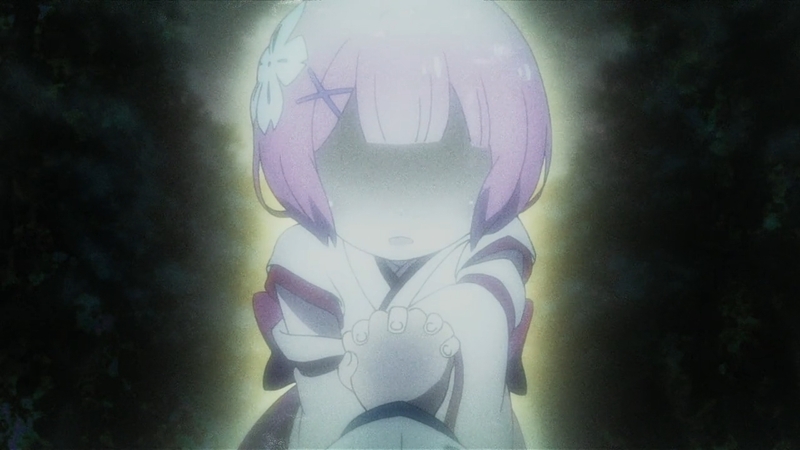 I think right now the only thing that truly bothers Ram is that she can’t help Rem to stop hating herself. Roswaal came to the rescue in spectacular fashion. Credit to Subaru for the ballsy move of using that spell (I knew he’d use that sometime) which got him a nice shot in on that shaman puppy. But he still needed to be rescued, which honestly is realistic. Subaru can pull off awesome moves, but he’s still only human. 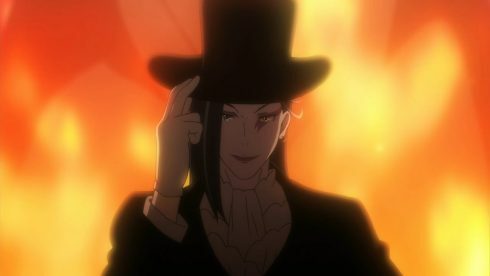 In a sense he was saved again by Emilia who probably begged Roswaal to head over there and wait for Subaru to use magic to lock down his location. We already knew he was really powerful, so it wasn’t a shock that he wiped out the beasts that had come together in a hurry. The scene with Ram later was plenty interesting. Revealing that Roswaal has his own goals which I’m not sure what to make of. He’s out to target the dragon? Why? Either way it’s quite the bold claim he’s making there. Plus I’m curious about Ram’s condition. 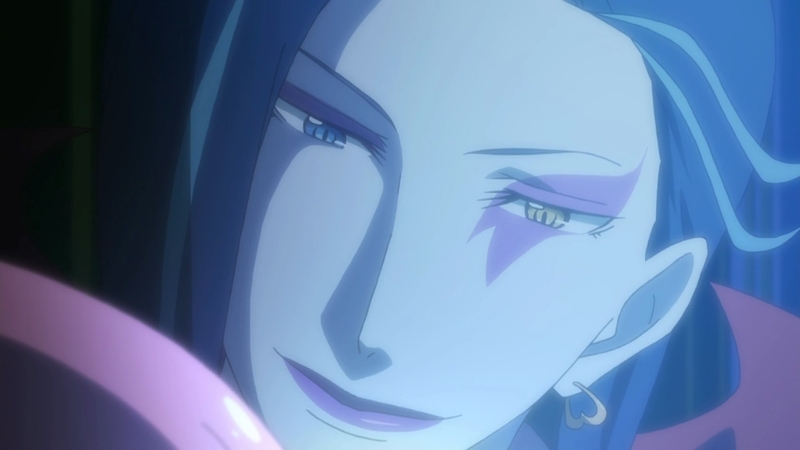 He seemed to transfer mana to her? Maybe losing her horn is an even bigger health crisis than I imagined. That she literally can’t survive without Roswaal tending to her and transferring mana to her. Would make sense if he had come across the twins at that point. Ram in a sense can’t separate from Roswaal and Rem stayed because she can’t separate herself from Ram. 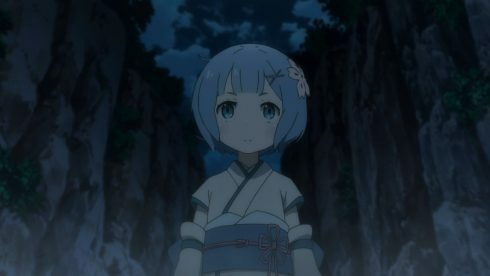 Enjoyed the little scene with Emilia and Subaru as well. 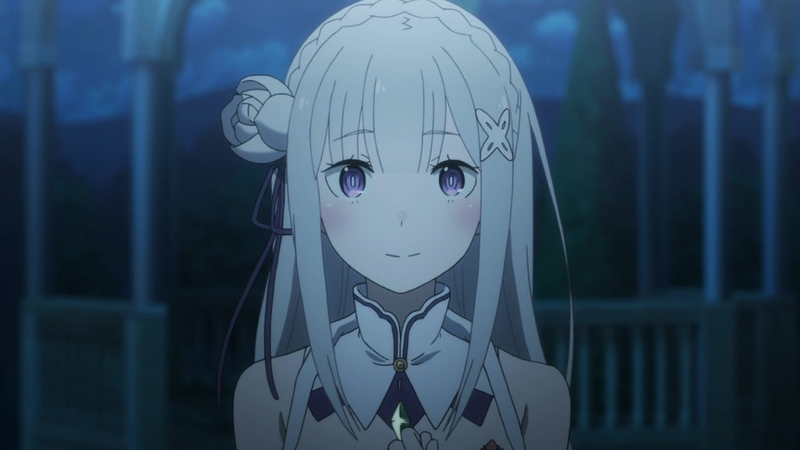 This arc was definitely about Rem most of all, but Emilia is still the main heroine here. Also to the translators of this episode….I’m pretty sure Emilia meant the opposite. 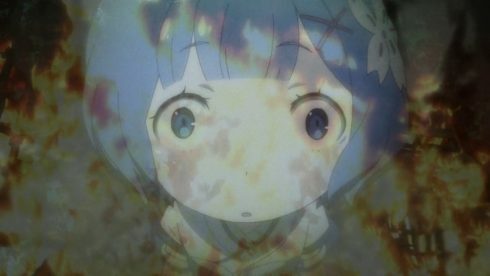 That Puck was desperately trying to stop Emilia from going after Subaru to help rather than telling her to. After all if Puck was the least bit determined to get Emilia to go…she’d have been there. 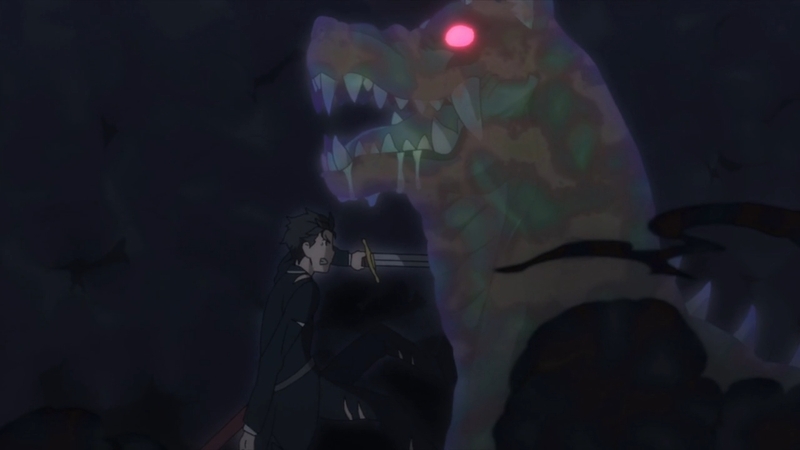 What I found more curious was her considering this situation as Subaru saving her. Does she really have a connection to the Witch after all? That she feel responsible for that person’s actions? Regardless her thanks is a pretty powerful weapon XD. 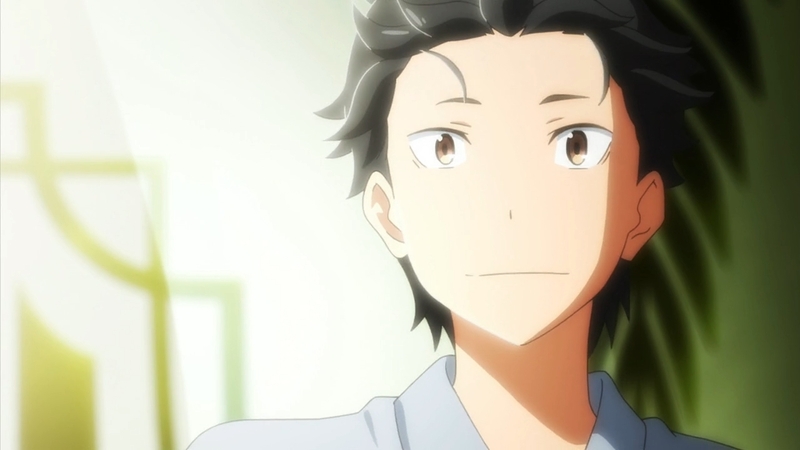 In the end Subaru gets a promised date….again. Here’s hoping he can actually enjoy that. I know his life is tough and difficult, but one fun date should be allowed right? Regardless the story moves forward. I’m curious where this is going to go. Maybe get back to Felt? Probably going to be related to the whole battle for the crown regardless. With the beasts having failed those against Emilia are likely to make another move. 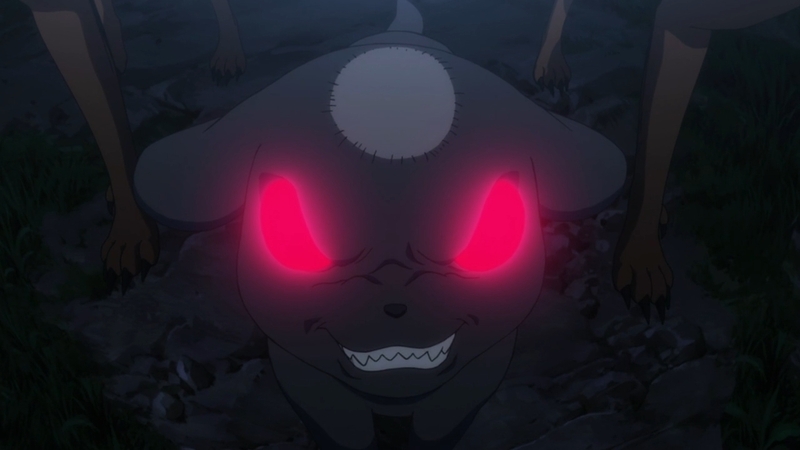 Also, yeah the mysterious girl without a name was apparently involved in this and is a beast tamer. Shocker there. It’s always the quiet ones, always. But, for now will just have to wait for the next episode.